What could be so special about a run-of-the-mill Submariner? It's not the watch per se, but rather the story that goes along with it, which makes it a "keeper" for Andrew. This ref. 14060M fell into his lap while working at a car dealership during a summer break in college. 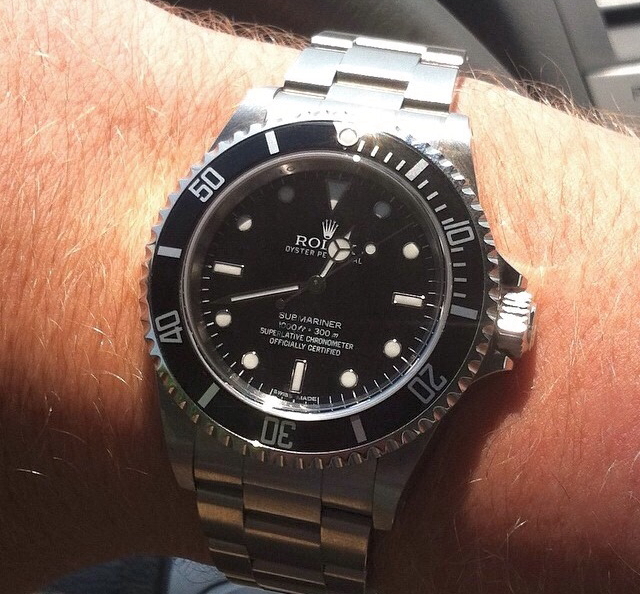 Back then, he couldn't shake the feeling of wanting his first Rolex - and it had to be a Sub. A coworker caught wind of his fixation and told Andrew that he just so happened to know someone looking to sell a Submariner... This person received it as a sales award, but preferred cash in hand to a Rolex on his wrist. Andrew was interested. He studied the price range Subs like this one trade within. His offer was somewhere in the middle: Absolutely fair, but not too much that he couldn't easily recoup his investment - or make a profit - should he have a change of heart. Fat chance of that happening; Andrew was immediately hooked. He told me "he couldn't have enjoyed it more." "It" being the Sub and the thrill of making the deal. In an industry where you can easily become jaded handling Daytonas, Pateks, and APs on the regular, keeping this Sub keeps Andrew humble and focused on his number one goal: "to see you in the right watch." Wearing it reminds him to make sure you feel just as "off the hook" and "ecstatic" with your purchase from him as he felt when he bought his Sub. For these reasons it's NOT FOR SALE. Andrew has a website in the works... For now, follow him on Instagram @afcwatches for new arrivals.